[PDF] Ultimate French Beginner-Intermediate (CD/Book) (Ultimate Beginner-Intermediate) | Free eBooks Download - EBOOKEE! Description: Ultimate French has everything you need to learn French from scratch or to revive the French that you learned years ago. This course combines conversation and culture in an easy-to-follow, enjoyable, and effective format. It's the perfect way to learn French for school, travel, work, or personal enrichment. 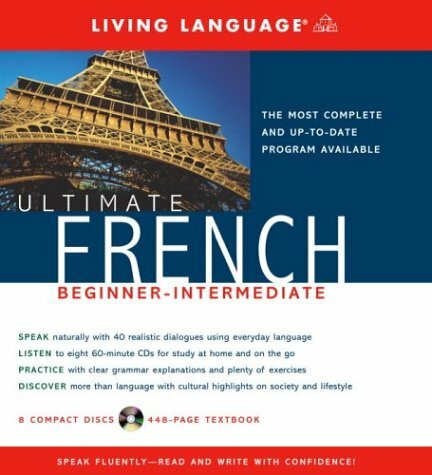 Ultimate French Beginner-Intermediate includes:â€¢40 lessons in a comprehensive 416-page textbook:Each lesson contains a lively and authentic dialogue, vocabulary, grammar and usage, step-by-step character writing, cultural highlights, and plenty of practice. The first ten lessons also include special pronunciation sections that will have you speaking right from the beginning. The book also contains review sections, readings, supplemental vocabulary sections, appendixes on essential French grammar, and a French-English/English-French glossary.â€¢8 hours of recordings with an ingenious two-step approach:Learn at home: Listen to the first set of recordings as you follow along in your textbook. Immerse yourself in French while you listen and repeat with the all-French recordings, and learn conversation, grammar, vocabulary, and moreLearn on the go: Then practice, review, and expand upon what youâ€™ve learned with the second set of recordings. An instructor will guide you through each lesson, and since no reading is required, you can listen in the car, on the train, at the gymâ€¦anywhere! No comments for "[PDF] Ultimate French Beginner-Intermediate (CD/Book) (Ultimate Beginner-Intermediate)".